It may not come as a surprise that my approach to giving birth differed a bit from the mainstream. 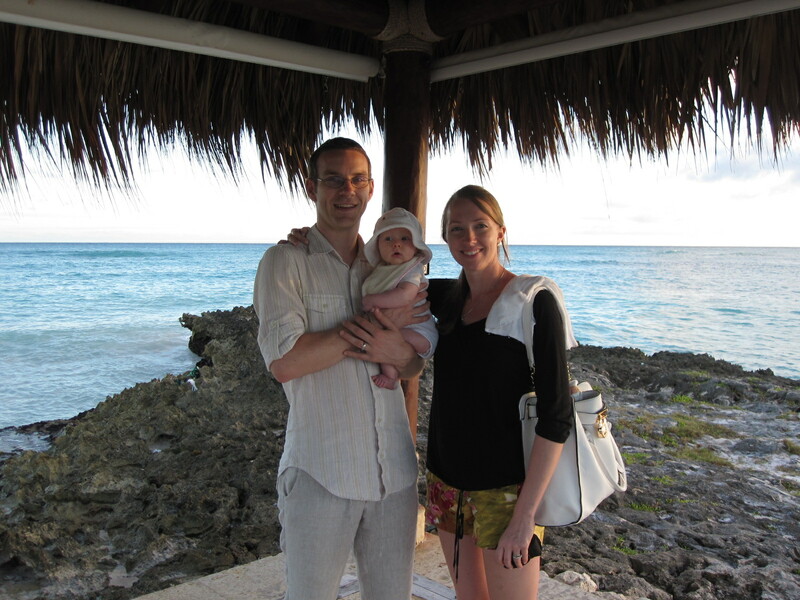 But the whole experience was amazing for me and my husband, and I’d really like to share this with you! I was pretty lucky throughout pregnancy. I didn’t have any major complications or even much morning sickness. The worst part was watching my legs and ankles swell well beyond their normal profile in the unrelenting heat of the July and August. 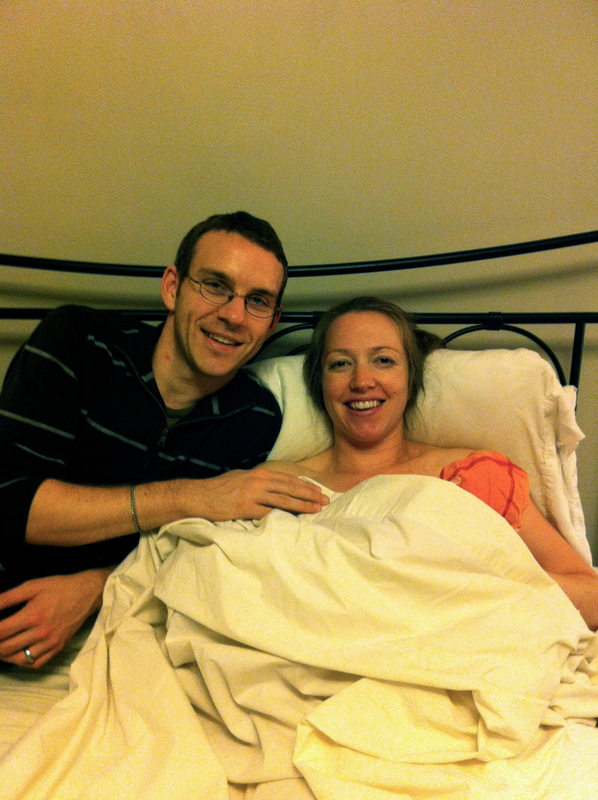 Because of this smooth pregnancy, Mike and I decided to plan for a home birth. We didn’t share this plan with many people–it tends to be met with shock, and maybe even horror. But we were confident in the decision. Our midwives were very excited for our plan, too. In the weeks leading up to my due date, I went through their checklist multiple times, gathering up all of the necessities to turn our bedroom into a Level 1 birthing centre! Waterproof sheets, extra towels, receiving blankets, snacks, Advil… Check, check, check, check OH.MY.GOD.I’M.HAVING.A.BABY! 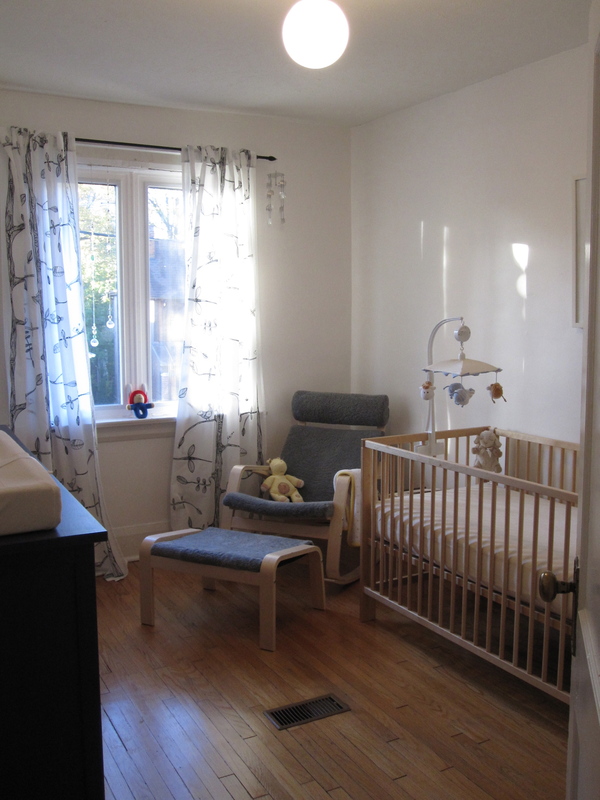 Linden’s Room, waiting for her arrival! My due date, September 26th, came and went. It was a Wednesday. The following Monday, October 1st, I woke up with what I knew were early contractions. It was a day off for me, so I “relaxed” at home. I made bread, chicken stock and soup. I sliced open my pinky while washing dishes. I had a momentary freak out when we lost power for about 5 minutes. I turned away the guy who came to install a water meter that day, which would have turned off the water for some hours. (He assured me that was the first time he’d ever encountered this situation!) Ironically, the midwives always joke that all they need for a home birth is electricity and running water, and both of these threatened to kick out! But by the late afternoon when Mike got home from work, the labour was really progressing and I was no longer puttering around the house. After a few phone conversations with my midwife student, Kristen, assuring me I could go a bit more on my own, I realized she’d been stalling. She and my primary midwife, Jennifer, were in the hospital with two other women in labour! So finally they sent over Christine, another midwife from the practice who was on call that day, but whom I’d never met. At that point, however, I knew this was for real and I didn’t care who showed up! When Christine arrived around 7pm, she laughed to see me on all fours on the bed, stripped down to my skivvies. I knew we’d get along. Now seriously into active labour, the benefits of having a home birth really showed. When Christine checked me, she saw that the baby was posterior–facing backwards. It wasn’t a huge issue, but Christine suggested that I walk the stairs; the up and down action could turn the baby. I did this for about an hour, bracing myself against the steps during each contraction. Sure enough, the baby turned. When I was in transition, that period of time before pushing when labour gets extreme, I again benefitted greatly from being at home. Now, when I had envisioned this home birth, I saw myself in the bathtub for a large portion of the time as I’d read that the bath was a fantastic pain management tool. So I scrubbed our bathtub in preparation. What I had not envisioned was the heat that I experienced in labour. I was roasting. Given the heat, I never got into the tub. But I did use the shower, and if nothing else, it was a needed distraction and change of scenery to help me through that period. It was about 11pm when I was ready for the final stage–pushing! Christine had been keeping contact with Jennifer and Kristen in the hospital. Mike played a much larger role than he may have had they arrived earlier–helping Christine set up her equipment and helping to guide me through the contractions. But we were all very excited when Jennifer and Kristen made it just as I was ready to push. The energy they brought with them gave me the boost for that last effort. I alternated between a birthing stool and different positions on the bed–whatever felt most comfortable in the moment. Now, I won’t lie. Labour HURTS. Supposedly, with methods like hypnobirthing, it is possible to experience a pain and med-free birth. But for me, it hurt. But at no point did I feel that I couldn’t handle it. A lot of my preparation for this home birth was educating myself about what my body was made to do and what it is capable of handling. So I KNEW that this was something I could do. Even at my worst, in the shower baying like an animal, I knew I could do it. And after 55 minutes that felt like 5, a baby quite a bit bigger than any of us expected came out and ended up on my chest. I remember hearing Kristen say, “Jean, take your baby” as she handed her up to me, and Mike announcing that we had a little girl! Grabbing this squirmy, hot, little wet thing was a moment of absolute wonder! It was exactly midnight on October 2nd. 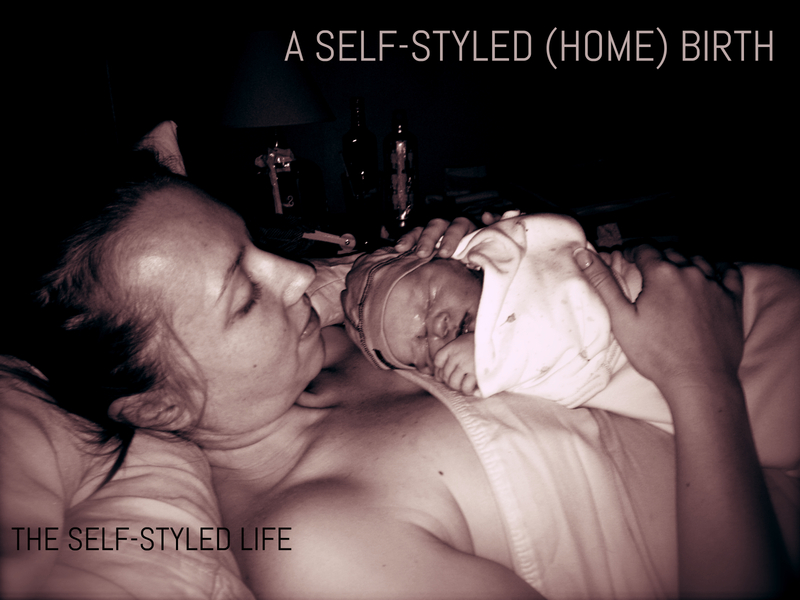 The post-birth experience at home was also incredible. The only moments I was separated from my baby were when they weighed her and gave her a check over to make sure everything was working well. The midwives cleaned up and got us all tucked into bed as a family. I slept with Linden on my chest that first night, feeling that I shouldn’t let her go just yet. All 8 lbs 2 oz of Linden on the scale. I loved that for about a week, she had never been outside of our house. Our first foray out into the world was a walk to the coffee shop about a block away. It was a bright blue fall day. I took in the cool breeze and the colouring leaves with this brand new human tucked in under my coat, and I knew we had a cozy winter ahead of us. In the Dominican Republic in January. If you have any questions about our home birth experience or are thinking of having one yourself, I’m happy to answer or share more thoughts on the experience! Ms Lily said ‘tears to her eyes’, well I’m sobbing. Loss of light and potentially water is interesting and profound. Always remember what you accompished on that “magical night” and the path that night opened to both of you. Now you know that you have an overwhelming capacity to love, and that growth is not an option because she needs and depends on you being the best you can be for her! Growing, learning to put another first while discovering a deep, satisfying, loving connection to another is a gift that parenthood confers on those willing to take the challenge! Yes, we are very excited for this experience in our lives! This little one has already taken over! Great piece, Jean! Thank you so much for sharing. Looking forward to getting to snuggle Miss Linden in person one of these days. Thanks, Rachel! Yes, we hope to see you guys soon! Thanks, Nada! I’m so happy it’s a good read. It’s hard to put something so big into words sometimes! Great piece, Jean! Thanks for sharing it. Lovely story Jean. 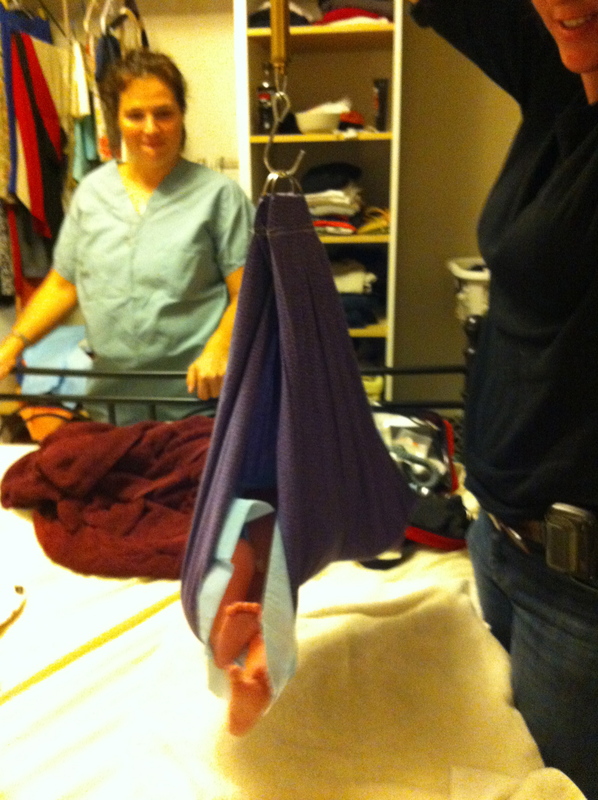 My friend is a mid-wife and she has helped many women give birth at home (in water or on stools). I think if you can, natural birth is a great thing. A women’s body is designed to give birth (as paninful as the whole process can be), and doing so naturally is something that should be encouraged more often! Yes, I’m always happy and excited to share the story in the hopes that it will encourage others who are considering it!